It marks the beginning of the new Ministry of Education’s strategies in partnership with various Sport Organisations, including Football to allow the young students to involve more in physical and sport activities. 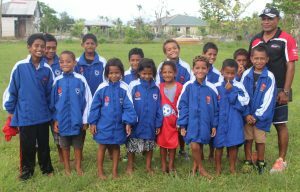 The move is a blessing for Tonga Football Association, as it pave ways for Just Play and the Game of Football itself to be practiced in a wider range of young kids. Just Play kicked-off its journey at the Government Primary School of Fasi moe Afi, followed by G.P.S Popua and G.P.S Ma’ufanga on Thursday and Friday, focusing on students in Class 5 level (age 9-10). About 250 kids so far has joined the fun of playing mini football matches, sidestepping cones, stepping through rings, running and collecting cones while clapping, screaming, laughing and all sorts of happy reactions that puts smiles on their faces after a long day of classroom work. The stunning display from the kids surprised G.P.S Fasi-moe-Afi’s Principle, Mrs. Leotisia Taumalolo, who believes Just Play has taught an invaluable lesson. 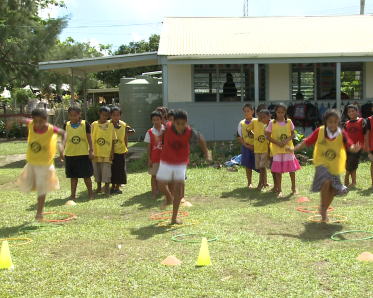 “I thought Just Play is all about exercising and playing football but what I see now is something different.” Mrs. Taumalolo said. Mrs. Taumalolo also praised Just Play. Meanwhile, Just Play Project Manager, Lui Muavesi believes it’s a good start for his team. “We are looking forward to the remaining stops in this long journey and hopefully the kid’s will fully enjoy the spirit of Just Play, which is having fun, live a happy life while playing football.” Muavesi added. The program will continue this week to the Primary School of Longlongo and Nuku’alofa and also Tonga Side School – Nuku’alofa Branch. The tour will run until August 24. Just Play is a sport for development program developped by the Social Responsibility Department of Oceania Football Confederation in partnership with the Government of Australia – through its agencies the Australian Agency for International Development (AusAID) and the Australian Sports Commission (ASC) – and Football Federation Australia (FFA) to roll out the programme across the Pacific. The Australian Government has shown its support to the Just Play programme by contributing AU$4million over three years. Click here to follow Just Play schedule.